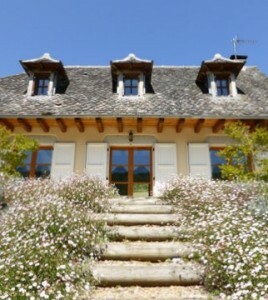 Formerly the stable of the 18th century farmstead, “La Domaine du Puech Fleury”, l’Etable is one of four beautifully converted former outbuildings set in landscaped grounds overlooking the valley of the Auze river, which flows into the Lot in the nearby village of St Projet. 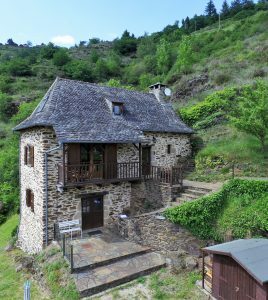 Built of local schist stone with a charming slate fishtail tiled roof particular to the area, the gîte offers a harmonious blend of traditional architecture and contemporary flair with accommodation for up to 6 people on three floors. 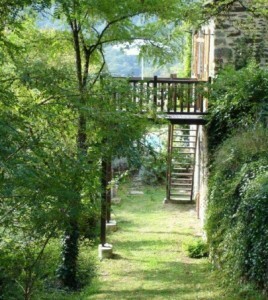 L’Etable has a private garden and use of the extensive communal grounds and swimming pool. 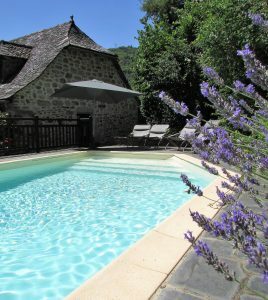 The former farmstead known as “la Domaine du Puech” is in a magnificent setting with an abundance of historical and natural interest. Its wonderfully landscaped grounds, rich with ancient trees, interesting shrubs, palms and Mediterranean mimosas look out over stunning views of the Auze river valley below. 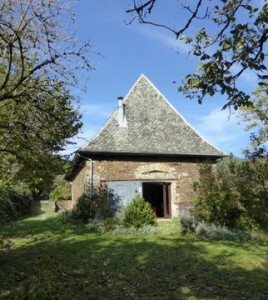 At the turn of the 19th century, the hamlet and several of those surrounding it, was home to a religious sect known as ‘the floured ones’. A fascinating history surrounds them, elements of which are still visible today.